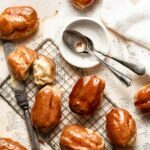 French Salambos made with homemade choux pastry, lemon pastry cream, dipped in homemade caramel, and topped with pink peppercorns. *make Lemon Pastry Cream prior to baking pastry. Preheat 400 F and line a baking tray with parchment paper. In a medium sauce pan on medium-high heat, add milk, water, butter, sugar, and salt. Heat until butter is melted, stirring with a rubber spatula. Once the butter is melted, turn temperature to a medium-low heat. Add all the flour at once, whisk quickly to incorporate and make smooth. Use the spatula to press and fold the batter as it firms. Remove from heat and transfer to bowl of stand mixer with paddle attachment. Add one egg at a time. Stopping to scrape sides and bottom of bowl between each egg. Don't over beat the dough. It will curdled at first, but soon turn into a nice uniform shiny consistency. You will know its ready, when you turn off the mixer and lift the paddle. If the dough hangs from the paddle without dripping off right away its done. Transfer dough to a piping bag fitted with a 2 inch round piping tip. Pipe 1 1/2 inch ovals, spacing a 2 inches apart. Smooth tops with a wet finger. Brush lightly with egg wash.
Bake for 15 minutes then reduce the oven heat to 325 F, baking another 15-20 minutes or until golden brown. *Make Lemon Pastry Cream, then place in the fridge to set. Combine lemon zest, eggs, flour, cornstarch, and sugar in a medium bowl and whisk together to form a paste. Remove hot milk from heat and slowly pour into bowl of egg paste. Whisking constantly to prevent eggs from cooking. Once all milk is incorporated, pour mixture back into saucepan on stove. On medium heat continue to whisk as the cream thickens. The thick cream should start to bubble after a couple of minutes. Remove from heat, then add chopped butter, lemon juice, and vanilla. Stir until butter is melted and cream is smooth. Transfer cream to a metal sieve and press through into another bowl using a rubber spatula. Cover bowl with plastic wrap, pressing plastic directly onto cream to prevent a skin forming. Place in fridge and chill for 2-3 hrs. Once pastry is baked and cooled remove cream from fridge. Transfer cream to a pastry bag with a 1/2 inch tip. Poke two holes in the bottom of each choux pastry. Holes should be spaced apart. Pipe pastry cream through each hole in the bottom of the Salambos until filled. Set aside and make Caramel. In medium saucepan add the sugar and water, whisk gently to mix. Place the pan on stove over medium heat and cook until the sugar dissolves. Mixture will turn clear within a couple minutes. Increase heat to medium high and boil until sugar begins to change in color. This can be anywhere from 5-8 minutes. Watch until sugar changes to the desired shade of medium amber. Wearing gloves dip the tops of each Salambo into the hot caramel and place on cooling rack. Sprinkle crushed pink peppercorns into hot caramel before it sets. Once caramel is cooled, enjoy your Salmobos with a glass of milk!